Nr. swaminarayan temple, beside aaryan embassy, from bopal bridge towards shilaj , Sp ring road, Ahmedabad. If you’re feeling like you have a lot to say these days, but you’re not exactly sure how to say it, consider painting it out instead. Consider how you could express your feelings, thoughts, and emotions through your own visual language? “Emotional Display” via colours, calm music and emminent mentorship. PAINT YOUR EMOTIONS SEASON 2 is in continuation to the Painting series. We shall comprehend your display in the last season to be held in early 2019. 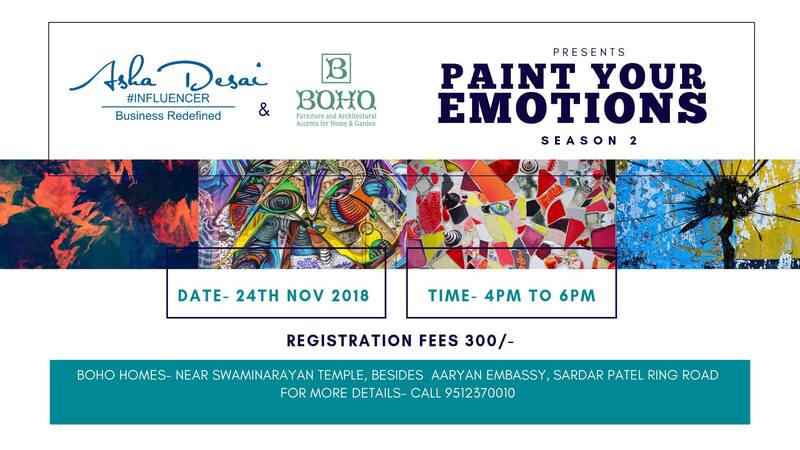 Register yourself to be a part of this therapeutic Painting Session at BOHO, The aesthetic venue of a stylish BOHO Home Decor adds essence to the event. BOHO is a vintage styled mini town venue with creatively displayed furniture, garden spaces and architectural accents will inspire you to spread your creative wings !